MIAMI - Only Eddie House’s nagging flu-like symptoms prevented the entire Celtics roster, the one management envisioned would make a NBA title run, from being together yesterday morning at American Airlines Arena. Marquis Daniels, still recovering from surgery to repair torn ligaments in his left thumb, made the trip. So did the rehabbing Kevin Garnett (knee), although he ducked out of shootaround when the media arrived. Kendrick Perkins hopped on the team flight despite a bout with food poisoning and produced one of his better games of the season against the Miami Heat. Paul Pierce (knee infection) made his first appearance since Dec. 22 in last night’s 112-106 overtime win. House, who will remain in Boston for another day or two, was the lone missing Celtic. Not one was playing in the NBDL. Not one was at home with a nagging injury. For the first time this season, the Celtics are nearing full health, and played one of their most impressive games of the season. Now it may take another week or two while Garnett’s hyperextended knee heals, but for the final 49 games of the regular season, the Celtics will work to get into top form, and in the short term they need to get their swagger back. And last night’s win helped, as the Celtics fought off Dwyane Wade’s season-high 44 points, 25 of their own turnovers, and porous rebounding to eke out another road win. And an acrobatic alley-oop layup by Rajon Rondo, back from hamstring woes, sent the game into overtime, providing a complete emotional turnaround after Wade had stolen the ball from Ray Allen for a streaking dunk with 0.6 seconds left to give Miami the lead. The Celtics dominated the overtime, holding the Heat to just 5 points. Following the game, the Celtics knew they were the better team, although they almost killed themselves with maddening inconsistency. It may take a few more games to reach the confidence level of Christmas Day, when Boston completely shut down the Magic without Pierce. Three consecutive road losses - two to downtrodden teams and then their first blowout - shoved the Celtics back to the pack of so-called elite teams trying to emerge in the Eastern Conference. There are no elite teams at this moment. Orlando already has 10 losses and Dwight Howard is in a scoring slump. Atlanta had dropped four straight games before winning last night. Cleveland lost at home to Charlotte Sunday. The Celtics, despite being besieged with nagging injuries, are tied with the Cavaliers for the top winning percentage in the conference, and now is the time for Boston to seize more confidence by rolling off some wins against a softer schedule. Teams such as New Jersey, Chicago, Detroit, Toronto, and the Clippers are on the horizon this month. And the Celtics will be challenged by tricky games against Atlanta, Dallas, and Portland, leading up to the Jan. 31 showdown against the Lakers. So it would be good for the Celtics to shrug off their late-December swoon, get healthier, and begin to rebuild that early-season chemistry that was so evident with a nine-game road winning streak. The Celtics had been stepping into visiting buildings with a swagger. Pierce and Larry Bird jerseys could be seen throughout the lower bowls of the stadiums. Boston made a statement with its defense, stifling the home team and cruising to victories. But that stopped in Los Angeles against the Clippers, when Rasual Butler was inexplicably left alone for a tying 3-pointer in the fourth quarter. And two nights later when Golden State’s Monta Ellis dribbled unimpeded to either elbow and repeatedly knocked down shots. And finally when Phoenix’s Channing Frye hit six 3-pointers and tallied 26 points, the Celtics’ road to humility was completed. So after a win over the Raptors Saturday night, the Celtics last night got two cogs back - Pierce and Rondo - while another one is healing. The run toward banner No. 18 now will begin. So it was up to Rondo and Pierce to return with their defensive mentalities to compensate for Garnett’s absence, and if they continue to do so this team still has enough talent to beat most NBA teams with ease. But it’s been nearly two weeks since that Orlando game, and nearly three since the Celtics were close to their full strength. Garnett’s absence leaves a gaping hole, but not one that can’t be filled by Rasheed Wallace, Glen Davis, and Shelden Williams, at least temporarily. 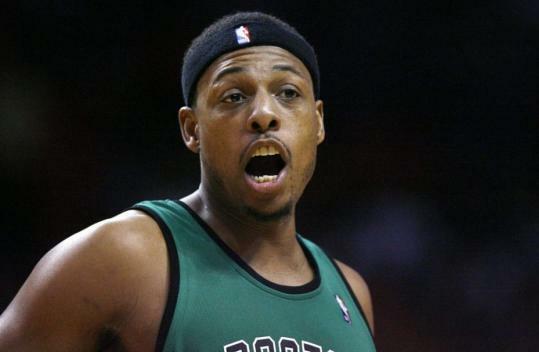 “I think we still have that edge,’’ Pierce said before the game. “We haven’t been playing well and we’re still at the top of the conference, one of the top two or three records in the NBA and we haven’t been playing well. We know that we when get healthy and have everybody out there, we’re going to be a dominant team again, so regardless of who we put out there, we’re supposed to win, night in and night out. But the Celtics can’t just wait for Garnett and Daniels to return. The groundwork for the push has to begin now, because the older core can’t be expected to turn on the swagger and execution on demand. That confidence and precision is built.